In terms of air defence, Finland was divided into theatres of operations and the home front. Most of Northern Finland belonged to the Northern Finland Group’s theatre of operations. Border Karelia and a part of Ladoga Karelia belonged to the IV Corps’ theatre of operations. The Karelian Isthmus and a part of Ladoga Karelia belonged to the theatre of operations of the Army of the Isthmus. Some of the troops intended for air defence of the home front were deployed in cities located at the rear of the theatres of operations, namely Viipuri and Sortavala. The Soviet air raids during the Winter War heavily targeted population centres and rail routes near the front line, but Soviet aircraft also bombed population centres far beyond the front lines. 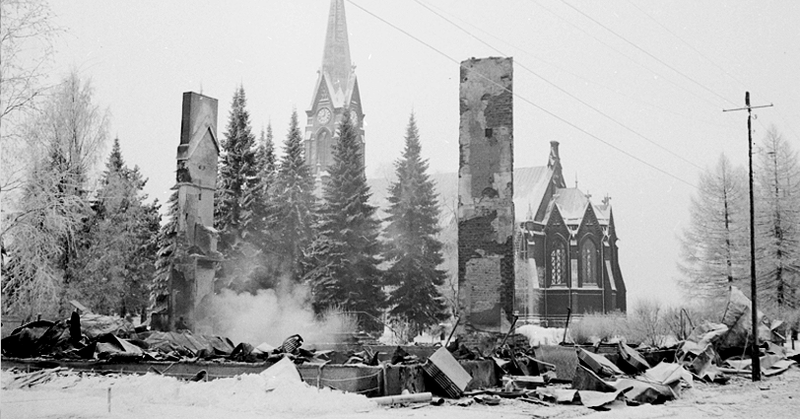 The ruins of a hospital in Mikkeli, destroyed in an air raid on 5 January. SA-kuva. Mikkeli was bombed several times. The greatest damage was inflicted in an air raid on 5 January 1940. Finnish personnel losses were 29 dead and 36 wounded. The city, dominated by wooden buildings, also suffered great material damage. After the air raid, a part of the General Headquarters was decentralised around the city. The commander-in-chief, Field Marshal Mannerheim, and the operative command of the General Staff relocated to the Otava District. The total losses caused by Soviet air raids on the home front and the rear of the theatres of operations during the Winter War were just shy of 2,800 people according to the statistics of civil defence authorities. A little less than a thousand people lost their lives. Almost 550 people were severely wounded and a little over 1,300 people were slightly wounded. On the home front, the areas with the strongest air defence at the start of the war were Helsinki, Turku, Tampere and Jyväskylä. Other air defence troops (Ad) on the home front were deployed at railway junction stations. There were also regional air defence forces deployed in Riihimäki, Lahti, Kouvola and Pieksämäki. At the start of the war, the air defence forces of the home front comprised 14 heavy and seven light anti-aircraft batteries. The air corps also participated in protecting the home front. However, the main focus in the deployment of fighter aircraft was at the rear of the Army of the Isthmus. According to Winter War-era statistics, Finnish fighter aircraft brought down 51 and the ground-based air defence 39 enemy aircraft on the home front. The air situation picture being kept up to date at the Regional Air Defence Centre (RADC) of Imatra on 7 February 1940. The centre’s mission was to form a picture of the air situation and relay it to the civil defence units and any air corps, ground-based air defence troops and other troops deployed in the region. SA-kuva. Finland was divided into 53 air defence regions, whose regional centres formed regional pictures of the air situation. The regional centres were divided into four classes based on the importance of the locality and the duties of the regional centre in question. The regional air defence centres (RADC) received the information on their air situation from air surveillance stations. In a theatre of operations, the regional centre was subordinated to the military formation that was in charge of the front line, such as the Army of the Isthmus on the Karelian Isthmus. On the home front, the regional air defence centres were subordinated to the home front’s air defence commander. There were 650 air surveillance stations in Finland, and they formed a network that covered the entire country. The network was densest in Southern Finland, up to the latitude of Pori–Jyväskylä–Varkaus–Joensuu. The air surveillance stations reported their observations to their own regional air defence centre. An air surveillance ‘Lotta’ from the Lotta Svärd organisation at the Äetsaari air surveillance station in Ruokolahti. SA-kuva. The air surveillance stations were located in tall buildings or towers in populated areas. In unbuilt environments, they were located in lightly constructed towers built for this purpose on elevated ground. 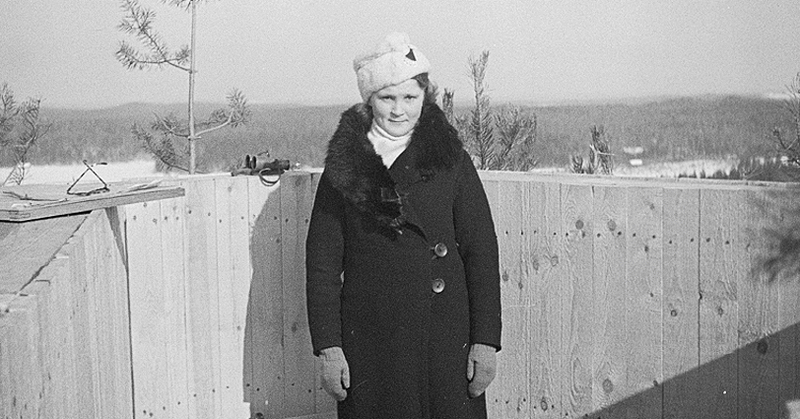 At air surveillance stations, round-the-clock surveillance was primarily performed by members of the Lotta Svärd auxiliary organisation for women who were trained for this duty. 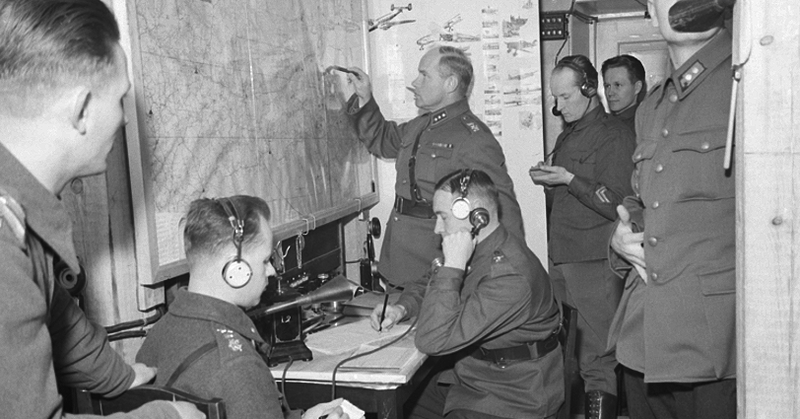 Poor telephone connections were the main reason why the air corps and ground-based air defence forces usually received the air situation picture in the theatres of operations too late. Air raid alerts were usually sounded in time on the home front.